Solar energy: .UEC (United Energy Corporation of Hawaii) Solar Facility in Borrego Springs, California uses both photovoltaic and solar thermal systems. 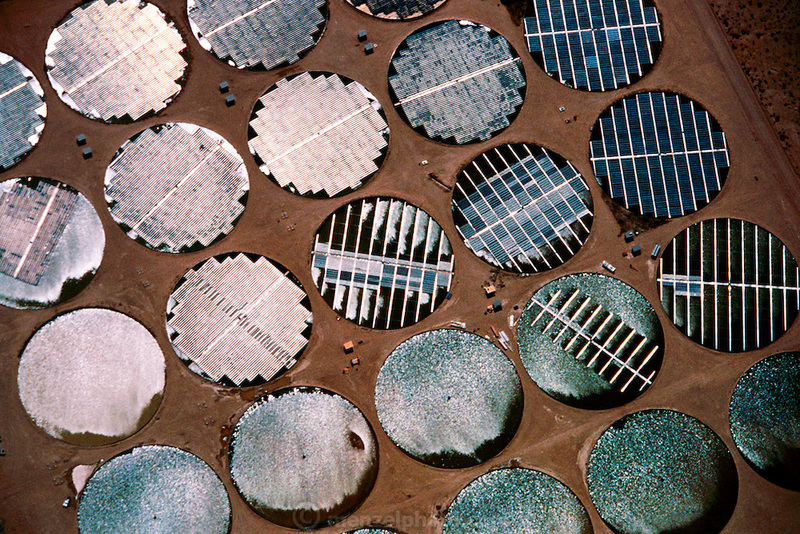 What makes their operation unique is that they use 3 acre round ponds to float their solar arrays on. The ponds act as a frictionless water bearing so that it requires very little energy to have the whole surface of the pond rotate to face the sun as it moves east to west. A series of small motors tilt the individual rows of the arrays to track the sun vertically as well. They use hot water from one type of array to run a huge still, which produces alcohol from molasses. So far there are 18 ponds. Borrego Springs, California (1990).